The school year is coming to an end, but that doesn’t mean things are getting any easier in our home. Things are busier than ever and it seems like there’s even less time to prepare healthy meals for myself and the family. For the most part I take the time to make healthy breakfasts and dinners for the family. I can even get my son’s lunch packed most days but when it comes to what I eat during the day, it’s not always healthy. I get so busy during the day doing errands, working and taking care of my little daughter I forget to make healthy choices when it comes to what I’m eating. So to make sure I’m eating super quick and easy mom meals and snacks I turn to lots of fresh fruits and plenty of yummy fruit smoothies. Smoothies make it easy for me to enjoy a delicious snack or even light lunch when I’m on the go. To make fresh smoothies (and smoothie bowls!) I keep lots of frozen fruits on hand. Frozen berries and tropical fruit pieces are great additions to healthy smoothies. I also love to add fresh spinach or kale for nutrition. For creamy goodness I like to add Hood Calorie Countdown to my smoothies. There’s a whole, 2%, Fat Free and even a chocolate-flavored choice to choose from. I like the 2% and of course the chocolate! The 2% has 42% fewer calories than traditional whole milk, that’s a huge calorie savings when you are watching your weight! 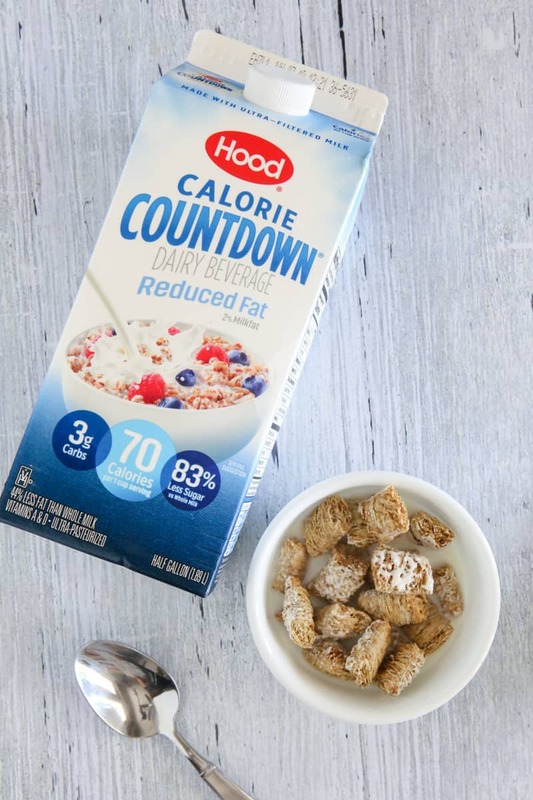 I also love to add Hood Calorie Countdown 2% to my morning cereal. It’s so delicious! The chocolate has just 80 calories and 56% fewer calories than traditional chocolate milk, which makes it a great choice for the kids or fun smoothies like this one. 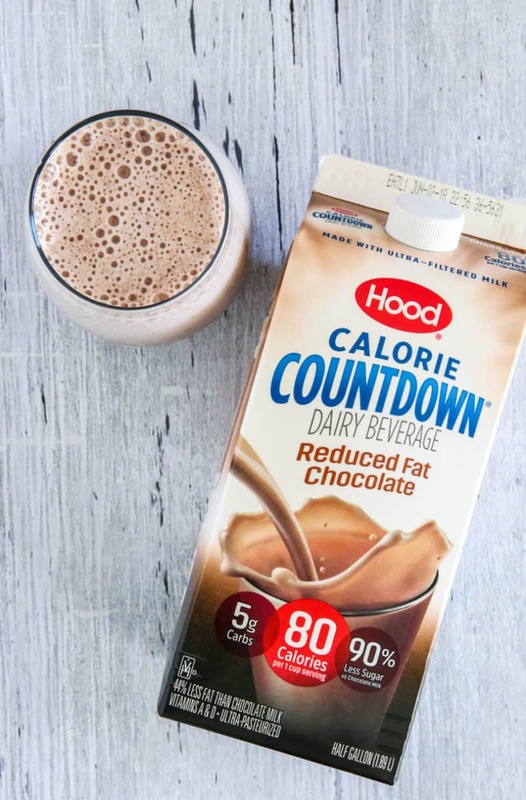 Hood Calorie Countdown blends ultra-filtered milk with water, cream (and other ingredients) for the most delicious and creamy taste while delivering fewer calories, less sugar, and fewer carbohydrates than regular milk! It also comes from farmers who pledge not to use artificial growth hormones, which is so important to me! 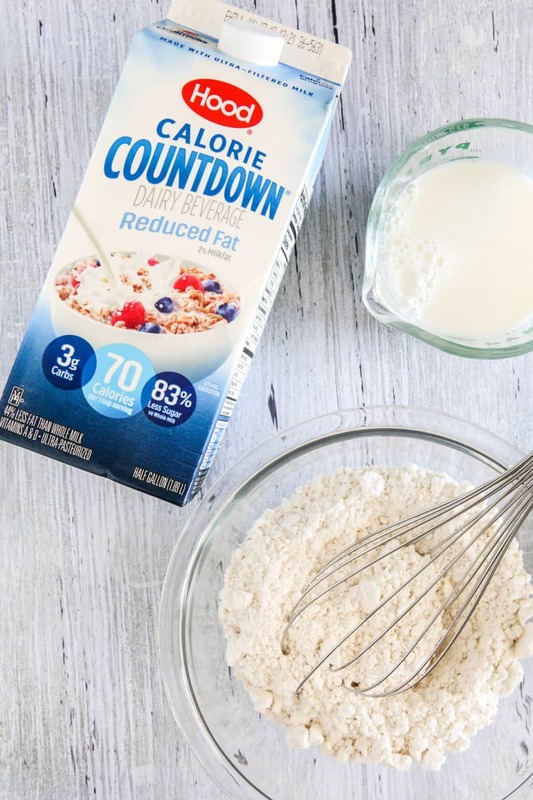 You can even use Hood Calorie Countdown in baking too! I like to add it to pancake and waffle mix. It’s amazing! This smoothie is my favorite go-to on super busy days. I always make sure I have fresh bananas on hand so I take a banana, a cup of chocolate Hood Calorie Countdown and some protein powder (or just a pasteurized egg!) and make a quick, easy and delicious protein packed smoothie I can take on the go with me. It makes a delicious pick me up to a hectic errand filled day. 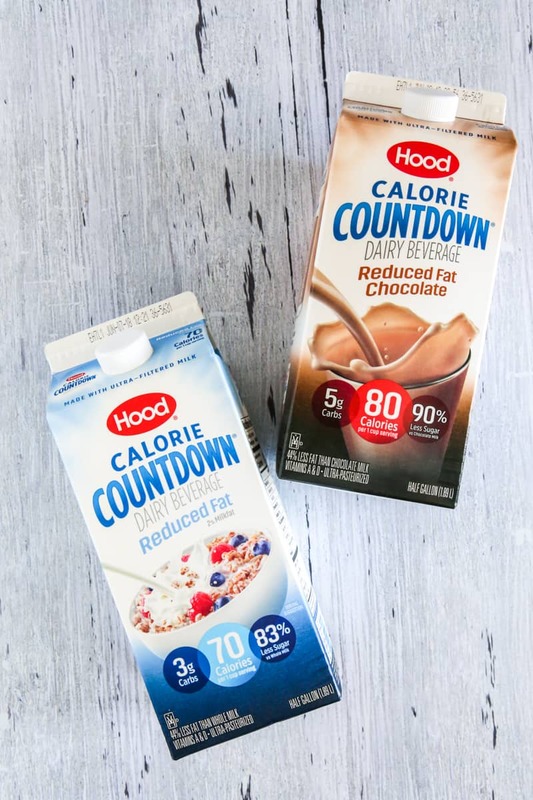 Be sure to also check out the Hood Calorie Countdown Website for even more recipes! Blend all ingredients together, serve and enjoy! This may come as a surprise to you but Hood products are not found in many parts of the USA. I live in Arizona and they have never heard of Hood Dairy products here. And just for clarity’s sake, I was born with the name “Hood”.